Egypt's President Abdel-Fattah El-Sisi says that the African Union (AU) will work on boosting the foundations of sustainable development and pave the way for a "prosperous" Africa. 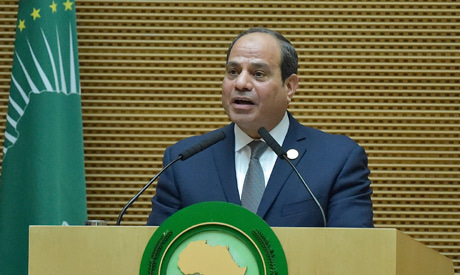 In a speech as the new president of the AU during the closing session of its 32nd summit in Ethiopia's Addis Ababa, El-Sisi presented the AU's priorities under Egypt's chairmanship in 2019, focusing on sustainable development and other important issues in the continent. The Egyptian president said that it is essential that the results of development benefit the continent fairly. "The African continent is a promising one with a lot of opportunities," he said. El-Sisi also said that "now is the time to take more effective steps to integrate sectors [in Africa] in development in various fields, especially given the continent's resources." The president said that the 32nd summit witnessed a "consolidation of African solidarity towards a number of issues in the region." The two-day summit was held under the theme of 'Year of Refugees, Returnees and Internally Displaced People,' which was chosen due to Africa’s efforts to stem human trafficking and forcible displacement. "We were able to reach a consensus on the union's priorities during 2019, including agreeing on building up the economic system through developing infrastructure, giving attention to post-conflict reconstruction, pushing forward with development, creating the conditions for the return of those displaced, and reforming the AU to make it stronger and more effective," he said. El-Sisi also called for deepening cooperation with international partners, including through global organisations, economic coalitions, and financing corporations to work on strengthening the continent's industrial capabilities and developing its economic system while diversifying the sources of energy and working to alleviate the harmful effects of climate change. Monday's speech came during the closing session of the summit, which saw the president deliver certificates to a number of public figures, including the director-general of the Food and Agriculture Organisation of the United Nations (FAO), José Graziano da Silva.